And you're talking about this season's cast! It's almost perfect! WHY? 3. This has to be the first time there's a father/son, mother/son, brother/sister, sisters and brothers altogether in the same race! Isn't that awesome? 4. The all-female teams doesn't look like Meredith/Maria, Lisa/Joni, Megan/Heidi, Kat/Pat that spells early elimination. 5. The old couple (Brad and Victoria) look better in shape than Teri and Ian and Fran and Barry, which means we're not going to just expect them to fall behind every leg. 5 perfect and good reasons for you to love this season cast, and probably this season as well. How could you even start hating them and not even feeling neutral? Regarding number 4, I don't like that. To me it almost feels as if they're stacking the deck towards the stronger F/F teams this season. Yes it's good to have DK types, but I don't want to see 3 separate all girl teams that look like they can win. It's like the producers are trying to cast Alpha-Female teams now. OMG!!! I love them so much! Who can win and make the race so much more interesting. How many times have we already seen and expected random all-female teams to be eliminated first. The only surprise that came for soooooo many seasons was Charla and Mirna making final 3 in allstars, Lyn and Karlyn in the final 3 and Kami and Karli and Linda and Karen making F5 and F4. They definitely look better than Kellie and Jaime, and tougher than Dustin and Kandice. I have yet to see a female team tougher than Dustin/Kandice, although Linda/Karen come close. I don't see this team as in the same league, but time will tell. Of course we all have yet to see a team tougher than them, that's why i'm using them for a comparison? Jaime nor Cara seem arrogant, Jaime was also a former police officer, and it takes a very self-less and strong willed person to put yourself in harms way for strangers. You know nothing about these women, and I think it is unfair to judge someone because they were or are a cheerleader and very attractive. For some reason I completely missed the part about Jaime being a former police officer. That makes me like them even more. It sounds like Cara and Jamie have inherited the dreaded "Curse of Michael". I have Michael's back on this one. He has not "officially" given his endorsement nor will he. We've all warned him. Jaime Edmondson worked at getting people fired up for six years as a Dolphin cheerleader. The experience came in handy when she had to talk a cheerleader colleague into helping her pursue a dream, which could pay off big for both of them. 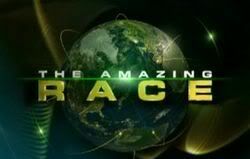 Edmonson, 29, and Cara Rosenthal, 26, were chosen as one of the 11 teams to participate in the next edition of The Amazing Race, which premieres Feb. 15. "I've been a fan of the show and I always wanted to do it," Edmondson, who grew up in Fort Lauderdale , said. She needed a partner and targeted Rosenthal (who is traveling in Europe and was unavailable for comment). "She is the most competitive person I know," Edmondson said. "I sent her a text message, 'Do you want to be on The Amazing Race with me? I think we can win.'" This was not an idle boast. Edmondson put a lot of thought into the effort. "I didn't want to do this with a family member or significant other. Those teams always get involved in their own issues instead of concentrating on the competition." Edmondson must be convincing. Rosenthal came on board even though it meant putting off life plans of her own. "Cara deferred law school on blind faith," Edmondson said. "I don't think I could have looked her in the face if we hadn't been chosen." There were long periods of doubt. They made the mandatory tape at the home of Rosenthal's parents in Boca Raton, where both women now live. "Her parents were laughing at us," Edmondson said. Weeks went by with no word. Then Rosenthal called. "You're going to get a phone call," she said. She had just gotten news that a talent scout liked their tape and was going to push them. Weeks went by again. "I guess we didn't get picked," Edmondson thought. Then they were invited to final auditions in Los Angeles. More weeks of high anxiety followed. Finally the call came Edmondson said seemed surreal. "We just want to let you know you're one of the teams." They began to train without knowing what they were preparing for. "You can only do so much in South Florida," Edmondson said. "I figured we would be fine for the warm places but you can't prepare for cold here." Little did they know one of the stops was going to be in Siberia. No matter how much prepping they did, Edmondson said, there was no way to anticipate the physical, mental, social and emotional ordeals they would face. "It was the hardest thing I have ever done." You'll have to watch to see whether it also was the most rewarding. It's like the producers are trying to cast Alpha-Female teams now. Solution: make one ALPHA season (alpha males, alpha females, alpha couples and alpha families) and one un-ALPHA season (no obvious alpha teams). Basically, try cast all teams to be in the same league. I believe Michael's curse will be broken this season! the REALY important question here is, what is their favorite book? I heard that in my sleep last summer. I was looking at that yesterday peach. Didn't think to bring it here! who does not love Harry Potter! I am so excited to see the show! Go red head beauties! I think I know what you mean. Sometimes you can just look at a team's picture and know their getting eliminated early. And I'm not talking about physical fitness either. Some teams just look like they won't last long, for no reason at all!